It’s easy to be impressed with Senatobia. Small town charm with proximity to Memphis’ amenities. A new sports park. Good schools and a growing community college. Active civic organizations and an involved community. A strong manufacturing base. It’s no wonder this town is on the move. The new $5.3 million sports park has baseball, softball, soccer and football fields, as well as a lake, concession stands and walking trails, reported Mayor Alan Callicott. It serves Senatobia and Tate County, as well as traveling teams, which benefits local businesses and restaurants. “Even the guy that owns our movie theatre here in Senatobia is seeing some benefit from this sports park,” he said. Next year’s project is a complete renovation of Senatobia’s wastewater sewer plant. After design and construction in 2018, the facility comes online in 2019. The entire project will cost an estimated $7 million. “We have to find the best funding source to do that,” Callicott said, adding that sewer rates will increase. Senatobia has a strong manufacturing base. In the past few years, the town has welcomed two new companies that are expected to create a combined 500+ jobs over the next few years. “These are global companies that needed something in this part of the country,” Callicott explained. The Tate County Economic Development Foundation is searching for a new executive director, but hasn’t paused its recruiting efforts. “We will continue to recruit new lodging options for Senatobia, new grocery options for Coldwater and a new restaurant in Downtown Senatobia,” said President-Elect Dr. Brant Kairit. Kairit said Senatobia offers a small community feel, with easy access to Memphis on I-55. “You can be at the Memphis airport in 20 minutes and go anywhere from there,” he said. It also serves as a bridge between the Delta and Memphis. The new executive director will promote Tate County’s livability and family friendliness, as well as its industrial side, said President Doug McClure. “We want to increase our focus on livability right now,” he said. There’s also a plan for the future. The industrial park has a grant to purchase additional, adjoining property, allowing for expansion, said McClure. Jerry Brewer of Brewer Realty and Appraisal Service believes Senatobia is in a growth path that runs I-55 south from Memphis. Based on MLS data, 68 percent of all home sales in Senatobia fell in the $100,000 to $200,000 range, with an average sales price of $127,000 over the last 12 months. “The real estate market in Senatobia now is relatively stable in the sense of properties going to market and being absorbed or purchased,” said Brewer. However, he said it would be an overstatement to call Senatobia a hot market in comparison to North DeSoto or Hernando, both closer to Memphis. “But we have a lot of folks down here who commute every day to Memphis to work,” he said. Mississippi Land Bank is headquartered in Senatobia. “We’re a full-service ag lender,” said Vice President of Business Development Hunter Taylor. It covers 32 counties in north Mississippi, including most of the Delta, with 18 of its 39 employees in Senatobia. Last year Mississippi Land Bank celebrated its 100th anniversary and branched out to offer a new service: financing crop dusters. Sycamore Bank opened in 1900. “We are not the oldest bank in the state of Mississippi, but we are one of the oldest banks in the state of Mississippi,” said Chairman and CEO Jay Tindall. With 56 employees, Sycamore Bank has its main office in Senatobia, with branches in Coldwater, Independence, Hernando, Southaven and Oxford. Just five years ago, Bloomberg Businessweek named Senatobia one of the best places in Mississippi to raise children. “We have a great public school system, a great non-public school system and a great community college,” said Callicott. Magnolia Heights School has enjoyed a 100 percent graduation rate with 100 percent receiving scholarships for the last eight years, said Associate Head of School Curt McCain. “There are only two schools in the state that are Apple Distinguished Schools, and we are one of those schools,” said McCain. This includes an accreditation process, then demonstration of continued use of technology to enhance education. Northwest Mississippi Community College has 7,676 students enrolled systemwide, said Director of Communications Julie Bauer. This includes nearly a 30 percent increase in dual enrollment, or high school students enrolled in college-level courses. The popular precision manufacturing and machining technology program, one of the college’s career-technical offerings, fills up early each year, said Bauer. Construction is nearly complete on a new 30,000-square-foot health sciences building. The Gary Lee Spears Center for Nursing and Health Sciences will house the associate degree of nursing, practical nursing and EMT-paramedic programs, as well as the new occupational therapy assistant and physical therapy assistant programs. Another treasure in Senatobia is the Baddour Center, a residential community for adults with mild and moderate intellectual disabilities. “It’s a jewel for our community,” said Callicott. “It brings families into our community that might not ever come here.” In fact, clients represent half the states in the U.S.
“We aim to provide a full life,” said Executive Director Parke Pepper. This includes helping clients recognize and grow their abilities. One opportunity is Baddour Custom Packaging, with 100 employees in fulfillment, distribution, storage and warehousing jobs. Pepper said some people feel those with intellectual disabilities have limited abilities. Numerous awards from companies such as FedEx prove differently. Baddour Custom Packaging packages tobacco products for American Snuff Company. “They benefit from our services, our quality and cost efficiency,” said Pepper. A retail/wholesale garden center on campus also employs residents. As poinsettia season approaches, the garden center will be bustling to supply churches and municipalities across the Mid-South with holiday flowers. “When we tell you we’re growing people and plants, we’re literally growing people and we’re growing plants,” said Pepper. Downtown is also growing. Senatobia Main Street is working to revitalize downtown, led by Chamber Director and Community Development Manager Jamie Sowell. Programs include May’s Five Star City Fest with music, a car show, arts and crafts vendors, a 5K race and a kids’ zone. Last year’s Trunk or Treat on Front Street brought 1,300 people downtown on a Tuesday night, Sowell said. There were free family movie nights in the park this summer and free music programs in the fall. Blues & Brews on Nov. 4 unveils a new Blues Trail Marker. Proceeds from events like the Five Star City Fest go to the pocket park on Main Street, which is transforming into a gathering space in 2018. “We never had events in downtown, so we didn’t need trash cans and benches,” said Sowell. Now they will be in place by the end of 2017. This year, Sowell said, Main Street gave $6,000 in façade grants to improve the outside of buildings. Downtown is also adding two murals. “It can completely change the look and feel of downtown with just a few coats of paint,” she said. Locally owned Sycamore Bank wants to invest in the community, said Tindall. When its operations center expanded last year, it moved into the remodeled old bank building downtown. “By doing this, we could help invest in the downtown district and hope that our move would encourage others to do so,” he explained. A coalition of determined citizens is working to restore and preserve one downtown structure. The Friends of the French Hotel wants to secure grant money for a study by a historical architect. It was able to have the French Hotel named to the Mississippi Department of Archives and History’s Ten Most Endangered Historical Places in Mississippi a few years ago. Buford Givens said the building is historically and architecturally significant, and dates to just after the Civil War. Italianate with elaborate brickwork, he said it is similar to the restored courthouse down the street, but in a state of disrepair. “I think it’s a treasure and we’re just need to recognize that,” said Givens. He hopes to see a boutique hotel on the second floor, with a restaurant and retail space on the ground level. Service is an underlying theme in Senatobia. Last year, the Senatobia Rotary Club’s annual cleanup day saw more than 290 people pick up trash along Senatobia’s roads, said President Addison Lawrence. The group sponsors a Boy Scout troop and two Interact Clubs, and holds regular blood and canned food drives. 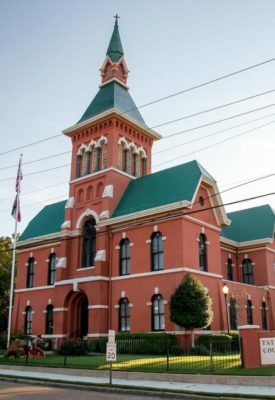 At Mississippi Land Bank, administrators are involved in the Tate County Economic Development Foundation, Rotary Club, Main Street, conservation associations, churches and schools. “We’re very active in the community and we’re proud to call it Land Bank’s home,” said Taylor. The current EDF president is an officer at Sycamore Bank, and the president-elect is a bank director, reported Tindall. Sycamore Bank is the title sponsor of the Five Star City Fest and the Northwest Mississippi Community College Rodeo, and a major sponsor of the Tate County Fair, among other area events. Senatobia Rotary Club provides a dictionary to every third grader in Tate County and sponsors scholarships at area high schools. Last year at Magnolia Heights, a student-led fundraiser raised $10,000 for St. Jude in one week. This year the school hopes to raise $15,000. Over Thanksgiving, students will travel to Atlanta to work at Operation Christmas Child’s packaging center. During Spring Break, there is a mission trip to Cuba. “We’re pretty active in the local community and the world community,” said McCain. Hunt chose to serve his hometown as Alderman-at-Large. “I know how good this community has been to me and I hope I can provide the same opportunities for other people,” he explained. “If you’re looking for a place to call home, if you’re looking for a place to open a small business, if you’re looking for a place for your children to go to college, come see us and you’ll see why we call it home,” said Tindall.